The worlds of professional wrestling and mixed martial arts have drawn their greatest stars from all walks of life, including professional football and collegiate wrestling. For any number of reasons, including similar techniques and skill sets, some of the biggest stars in each world have crossed over from the world of MMA to professional wrestling, and vice versa, to varying degrees of success. As Ronda Rousey embarks upon her new journey in the world of WWE after a prolific run in MMA, we're taking a look back at the biggest successes, missteps and everything in between for those who've tried to be dual threats in both worlds. 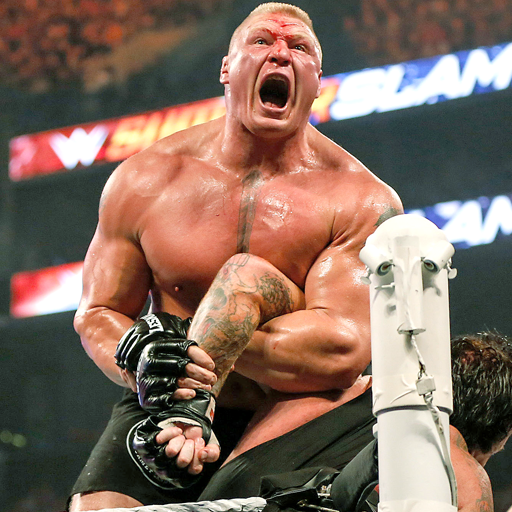 By almost any measure, Lesnar had far and away the most successful crossover between the WWE and MMA, and then back and forth again, as the only man to ever hold both a UFC title and a WWE world title. After twice earning junior college All-American recognition as a heavyweight amateur wrestler for Bismarck State College, he transferred to Minnesota and became a two-time Division I All-American in his junior and senior years; he capped it all off as a Division I national champion in 2000. Later that year, Lesnar signed with the WWE and trained over the next couple of years before debuting on Monday Night Raw in March 2002 and almost instantly surging toward the top of the food chain. By August 2002, he had defeated The Rock to become WWE undisputed champion, making him the youngest WWE world champion in history at the time at 25 years of age. He would have a number of world title reigns and memorable rivalries, but he left the WWE to pursue a career in football with the Minnesota Vikings. 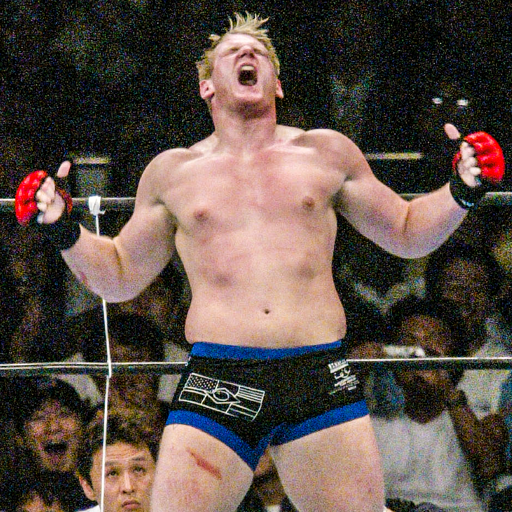 After failing to catch on, Lesnar ultimately found his way to MMA in 2006 and won his first pro MMA fight in Japan in 2007. He lost in his UFC debut against Frank Mir after getting caught in a kneebar, but he became UFC heavyweight champion after beating Heath Herring and Randy Couture in the span of three months. He lost his last two UFC fights during that run, to Cain Velasquez and Alistair Overeem, and just a few months later returned to the WWE, where he currently reigns as Universal champion. 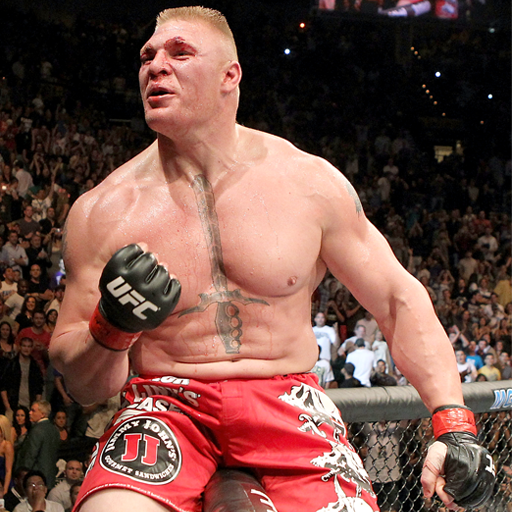 While under contract with the WWE , an agreement was reached in 2016 to allow Lesnar to return to the UFC for one more fight at UFC 200; he won against Mark Hunt, but the decision was later turned into a no contest after Lesnar failed a USADA drug test. No matter the format of the fight, be it Greco-Roman or freestyle wrestling, judo, jiu-jitsu or almost anything else, Severn was willing to throw down with anyone who crossed his path. After a collegiate wrestling career that saw Severn become a three-time All-American at Arizona State, Severn eventually found his way to professional fighting and the UFC in December 1994. At UFC 4, when the format was a single-elimination one-night tournament, Severn lost in the finals to Royce Gracie after a single continuous round that lasted over 15 minutes. 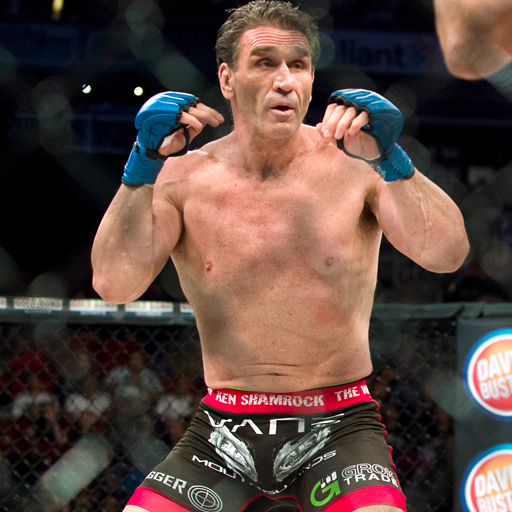 Severn won the UFC 5 tournament, but he lost the first ever UFC Superfight championship bout against Ken Shamrock, in a time when there were no weight classes. After winning the UFC's Ultimate Ultimate 1995 tournament, Severn won a split decision over Shamrock to win the title. He would eventually lose a unification fight for the first UFC heavyweight championship to Mark Coleman in 1997. Severn last performed for the company in September 2002 at UFC 27, but he continued to fight all over the world for the next 17 years; his professional record now sits at a staggering 101-19-7. In a parallel of his UFC Hall of Fame career, Severn also put together a fairly illustrious pro wrestling career. He's a two-time NWA world heavyweight champion and NWA Hall of Famer, and Severn also spent a year-and-a-half stretch with the WWE in the late 1990s. 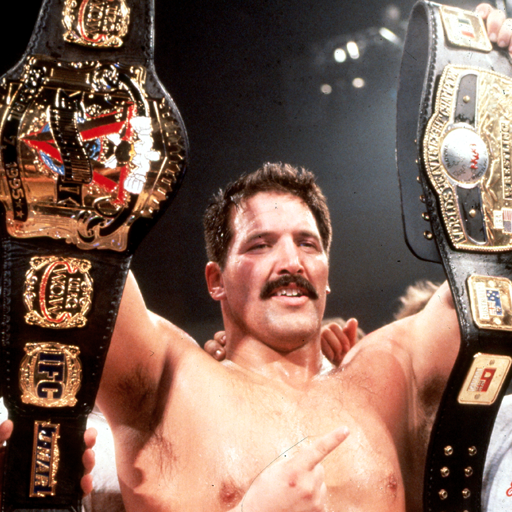 Though Dan Severn made the crossover at a similar time, Shamrock was the first UFC fighter that most pro wrestling fans became familiar with in the 1990s. What many fans don't know is that before he began his professional MMA career with Pancrase in Japan in 1993, Shamrock trained to become a professional wrestler and performed throughout the early '90s in the United States and Japan. On Nov. 12, 1993, just four days after winning his third pro fight in Japan, Shamrock competed in UFC 1 in Denver in the first of its one-night-only tournaments. After winning his first fight, he lost via submission to Royce Gracie in the semifinals. Shamrock split his time between Pancrase and the UFC over the next four years, and he became both the first ever Pancrase Openweight champion and the first UFC Superfight champion. After pushing his MMA record to 23-5-2 in December 1996, Shamrock moved his focus over to the then-WWF, where he made his TV debut in February 1997. His WWF career lasted until late 1999, as Shamrock became an Intercontinental champion and tag team champion while maintaining an intense persona as "The World's Most Dangerous Man." He stepped away from the WWF to resume his MMA career in 2000, but he subsequently performed for TNA wrestling in its early days and even became NWA heavyweight champion; Shamrock's last recorded match was against Josh Barnett in Japan in 2004. The MMA world he returned to was a far different one, and though the UFC Hall of Famer only won a handful of his fights from there on out, Shamrock's trilogy against Tito Ortiz helped raise the profile of the UFC's heavyweight division. When it comes to legendary figures in the world of Japanese professional wrestling, it doesn't get any bigger than Inoki. He trained under the likes of Rikidozan and learned grappling and shoot fighting from Karl Gotch. He founded New Japan Pro Wrestling. 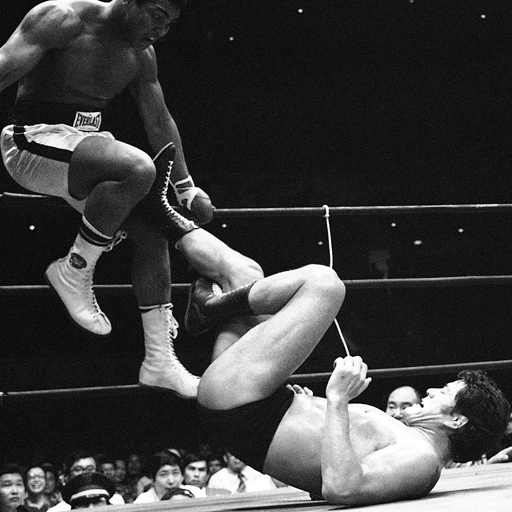 Inoki's wrestler versus boxer fight with Muhammad Ali, though universally panned for how it played out, helped lay the groundwork for what mixed martial arts would become. Inoki helped bring a gigantic wrestling show to North Korea in the mid-1990s, where he faced Ric Flair and entered politics in Japan. Inoki is an icon inside the ring. 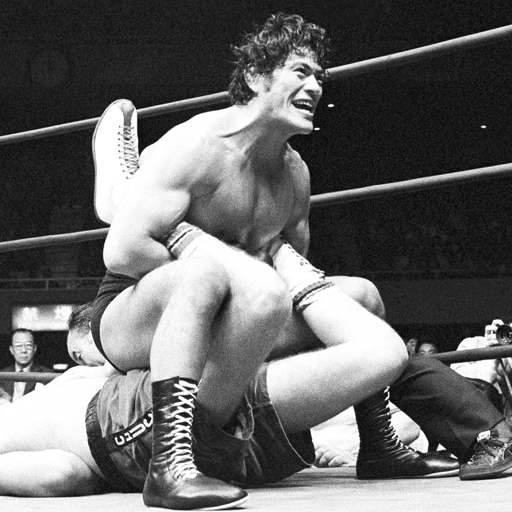 He eventually was inducted into the WWE Hall of Fame in 2010, but his impact outside of wrestling and MMA further shows how effectively Inoki was able to cross over throughout his life and career. CM Punk began his foray into pro wrestling as part of the backyard wrestling movement in the mid-1990s, before moving on to a variety of indie promotions -- a run that that culminated with Ring of Honor in 2002. Over the next three-plus years, Punk broke out with attention-grabbing matches against most of the biggest names in independent wrestling at the time, including Bryan Danielson (Daniel Bryan) and Samoa Joe -- the latter in a three-match series of 60-plus-minute matches that put him on the map. After signing a contract with the WWE, Punk eventually made his way to their ECW brand, where he eventually became champion, and he later won five WWE world titles; his rivalry against John Cena in 2011 and 2012 cemented him as one of the company's most popular stars. 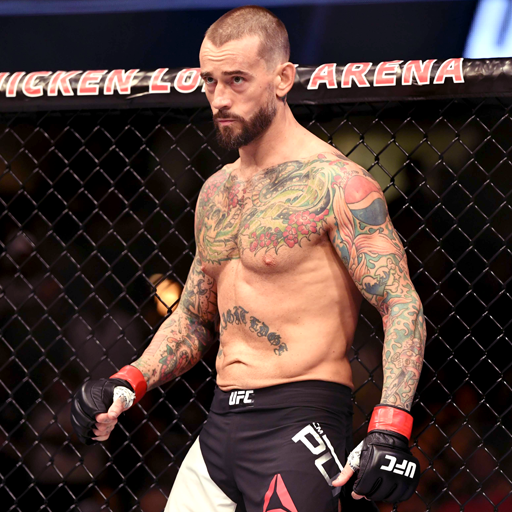 Punk had an acrimonious split from the company in early 2014, and by the end of the year had announced he had signed a multifight contract with the UFC. After nearly two years of training, including several false starts due to injury, Punk fought Mickey Gall on Sept. 10, 2016, and lost a one-sided contest via a first-round submission. He has not fought since but still aims to return to the Octagon. 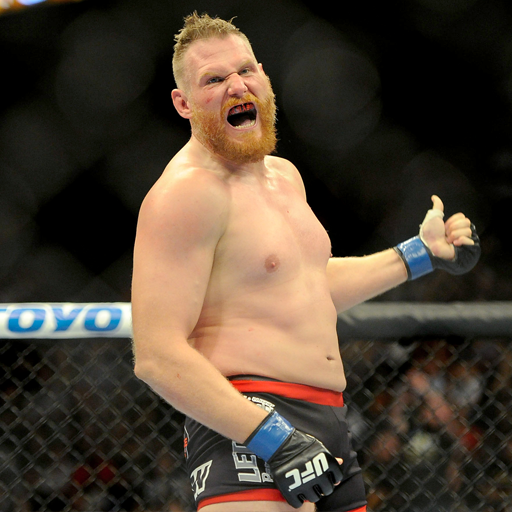 Josh Barnett trained in martial arts such as judo and kickboxing from a young age, and by the mid-1990s, he had begun training at a dojo in Montana. 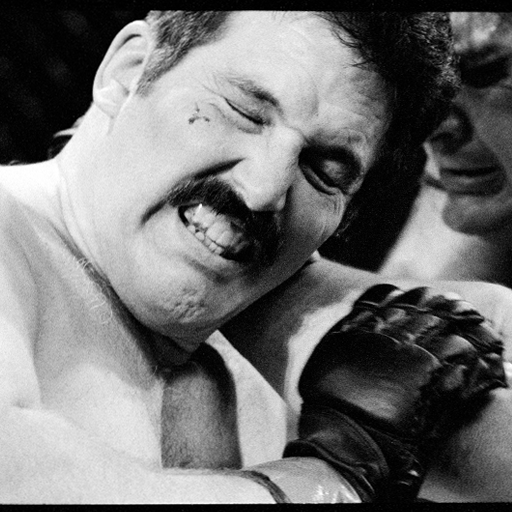 His MMA career began in Washington in 1997, and he would go on to win his first nine fights in Washington and Hawaii that included a submission win over Dan Severn in 2000 that helped bring him to the UFC. In his fifth UFC fight, Barnett defeated Randy Couture to become the youngest UFC heavyweight champion in history at the age of 24. A failed drug test ended his first run in the UFC, which sent Barnett to Japan to pursue both of his fighting passions -- MMA and professional wrestling. Barnett's first pro wrestling match could not have come on a bigger stage, as he faced Yuji Nagata for the IWGP heavyweight championship at the Tokyo Dome for New Japan Pro Wrestling on Jan. 4, 2003. (The annual Jan. 4 show that would later be called Wrestle Kingdom starting in 2007.) He would later go on NJPW tours in Japan in 2003 and 2004, and he even competed in a pair of sanctioned MMA matches at NJPW pro wrestling cards in May and October of 2003. Barnett fought his way back up in MMA in Pride and Strikeforce and eventually returned to the UFC in 2013. He also has remained involved in pro wrestling, with recent appearances in Impact wrestling and a full-time English commentary job for NJPW broadcasts on AXS TV alongside Jim Ross. Like a number of other people on this crossover list, Bobby Lashley's entryway into both worlds was his background in amateur wrestling. He was an NAIA national wrestling champion at 177 pounds for three years from 1996 to 1998 at Missouri and then enlisted in the U.S. Army for three years. A freak accident while Lashley was a bystander at a bank robbery cost Lashley his U.S. Olympic dreams in 2004, but later that year, he signed his first contract with the WWE. During 3½ years with the company, he was a two-time ECW champion and a one-time United States champion, but his most famous match came at WrestleMania 23 in 2007. In that match against Umaga, who was Vince McMahon's proxy, he won a hair vs. hair match as a representative for Donald Trump -- forcing McMahon's head to be shaved. 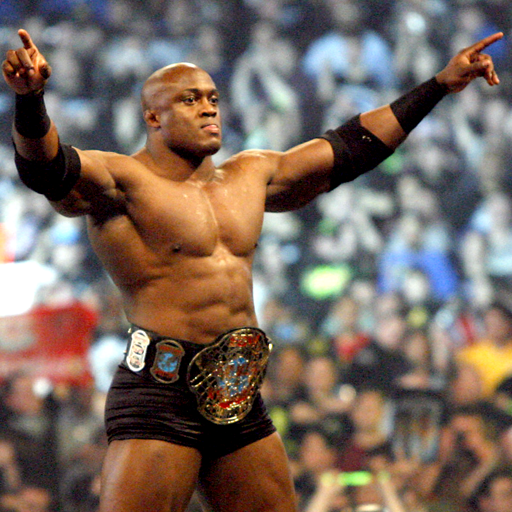 After his WWE release, Lashley pursued a fighting career and went on to win his first five professional MMA fights, all while pursuing pro wrestling outside of the WWE at the same time. 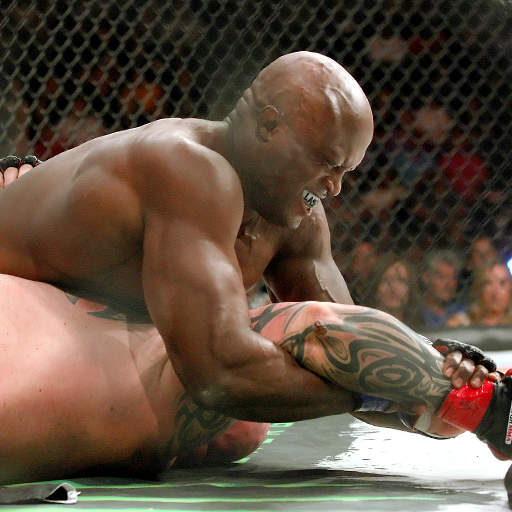 Lashley is currently under contract with Bellator and boasts a professional record of 15-2. As Ronda Rousey enters the world of the WWE, she does so alongside one of her longtime compatriots -- fellow "Four Horsewomen" and MMA associate Shayna Baszler. As far as pedigree goes, it doesn't get much better than Baszler's; she trained in catch wrestling under the legendary Billy Robinson and became the first woman to become a certified catch wrestler in the United States. She also trained in Brazilian jiu-jitsu and Muay Thai boxing. Baszler fought through good and bad stretches early on in her MMA career, but a four-fight winning streak earned her a shot against current UFC featherweight champion Cris Cyborg. She lost the fight against Cyborg, and another against Sarah Kaufman, but another four-fight winning streak in 2010 set her up for fights in Invicta FC and the UFC. In her last UFC fight, Baszler took on future UFC women's bantamweight champion Amanda Nunes in March 2015. By that time, Baszler began to be mentored by Josh Barnett, who would eventually create her "Queen of Spades" moniker that has stuck to this day. She competed in the world of independent wrestling in North America and Japan, until she caught the attention of WWE officials and became one of 32 women to compete in the inaugural Mae Young Classic in 2017. Baszler made it to the finals in Las Vegas, where she lost to Kairi Sane, but she soon signed with the WWE and was assigned to its NXT brand. On Saturday in Philadelphia, she competed for the NXT women's championship and lost to Ember Moon. After beginning his pro wrestling career in 2000 as Dos Caras Jr., Del Rio kicked off his parallel career in mixed martial arts in 2001. He went back and forth between wrestling promotions such as AAA and CMLL and a variety of MMA companies over the next few years. By the time Del Rio had finished his fighting career in February 2010, he had racked up a professional record of 9-5. 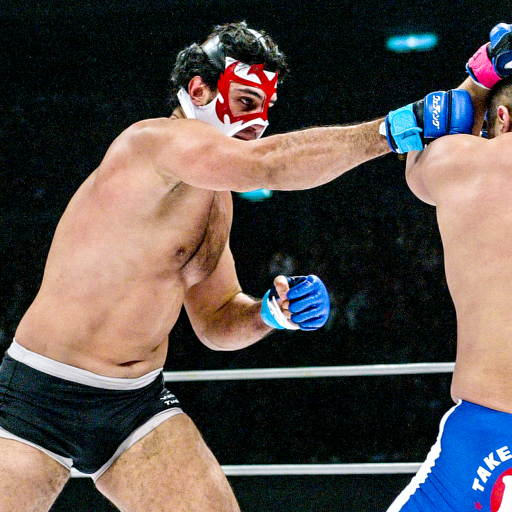 He competed in MMA while wearing his wrestling mask, and his most famous fight, against Mirko Cro Cop at Pride Bushido 1, ended with Del Rio taking a highlight-reel kick to the head less than a minute into the first round. After wrapping up his MMA career, Del Rio would go on to WWE, where he would eventually become a four-time world champion. He now wrestles for a variety of companies outside of the WWE, including Impact wrestling, and he is the president of the MMA organization Combate Americas. Nakamura became an incredibly popular wrestler during his 14-year tenure in New Japan Pro Wrestling, largely due to a style that eventually earned him the nickname "King of Strong Style." In three reigns as IWGP heavyweight champion -- the first of which came at the age of 23, making him the youngest such champion in the company's history -- as well as five runs as its Intercontinental champ, Nakamura was one of the central forces that helped bring NJPW back to prominence, alongside contemporaries such as Hiroshi Tanahashi and Kazuchika Okada. But long before he left his longtime home and came to the United States to join the WWE (where he became a two-time NXT champion to this point), Nakamura took some of his training in the dojos of Japan and stepped into the world of mixed martial arts. His first pro fight came on a show promoted by Japanese icon Antonio Inoki, and he lost to Daniel Gracie. He came back to pick up his first professional MMA win at NJPW Ultimate Crush -- the same card Josh Barnett fought on -- and went on to fight twice for K-1 before calling it a (short) career with a record of 3-1-1.